Seed pearls are very small; less than a one-quarter grain in weight, smaller than 2mm in size and off-round in shape. Historically they occurred naturally and were used as a decorative border, as tiny accents in small patterns, or in larger clusters woven together to make up an entire piece of jewelry. A nineteenth-century obsession with pearls is evident in the profusion of tiny seed pearls on every type of jewelry imaginable. 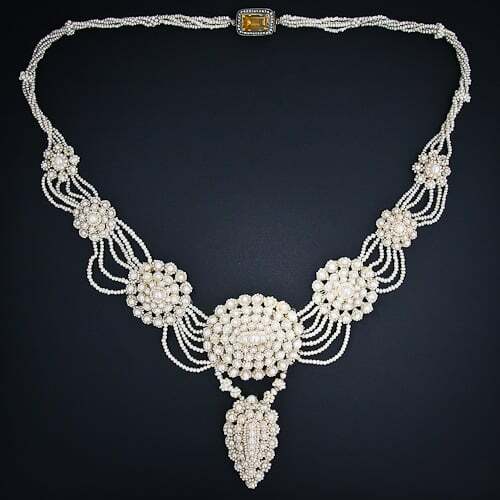 Imported from India and China, seed pearls were strung on white horsehair or silk and sewn to mother-of-pearl templates to create elaborate designs. The typical seed pearl parure was composed of a pair of bracelets, a brooch, a pair (or two) of earrings, necklace, ring, and aigrette. Considered chaste and elegant, these amazingly elaborate seed pearl parures were deemed to be an appropriate bridal gift and always apropos in the ballroom Famously, Mary Todd Lincoln received a Tiffany & Co. seed pearl parure from her husband to wear at his inauguration. Durability: Good to Fair, Can be Scratched, Will Crush. Gem Reference Guide, Los Angeles: Gemological Institute of America, 1988. Pp. 169-171. Newman, Harold. An Illustrated Dictionary of Jewelry, New York: Thames and Hudson, 1981. Pp. 274. Schumann, Walter. Gemstones of the World, New York: Sterling Publishing, Co., 1977. Pp. 222-231.